Are you getting ready to insert soft contacts for the first time? Do you have difficulty inserting your contact lenses? Here is a video that should make putting them in a little easier! Let’s start with soft contact lenses. Watch the video below to learn how to apply soft contacts. What happens when you insert soft contacts that are dirty? Bad, horrible vision problems. Make sure your contact lenses and hands are clean before you insert them into your eye. Remember, everything that comes into contact with your eye has the ability to transfer bacteria directly to a critical organ. Take the time to wash your hands. Look at your contact lenses and decide if they’re clean enough. If not, wash them thoroughly with a moisturizer-free soap. When you pick-up your soft contact lenses from Dr. Leonard’s office in the San Fernando Valley, it’s important that you store them in a dry,cool, dark area. UV rays and extreme heat can damage contact lenses. The container they come in will look like a vile of liquid with your lenses floating within. Use your contact lens tweasers to gently remove the soft contact lenses from their container. After your soft contacts have left their shipping container, it’s time to give them a good soak. After about 2 hours in your contacts container, they’ll be ready for you to wear. This is an important step because it removes the chemicals from the deliver container. It also helps the soft contacts maintain their softness. Because of this, your soft contacts will be more comfortable on your eye for long periods of daily wear. Take your soft contacts out of the container and rest them on two fingers. Then, gently place them onto your eye. Pay careful attention to which lens in meant for each eye. Many users find it easier to look to the side while applying their soft contact lens. As the eye re-centers and blinks, the soft contact will center itself. 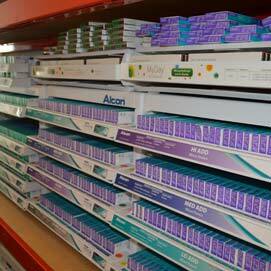 Soft contact lenses from brands like Alcon allow Dr. Leonard's patients to quickly improve their vision.